One of the biggest drawbacks to working with Webtop productivity applications such as Google Docs or Buzzword is that they force you to work simultaneously in two different worlds: the online world and the desktop world. You can upload your desktop documents one at a time to these services, and they convert them for you into a Web-based document, but there is no easy way to bulk upload your docs. And syncing between the two worlds is more trouble than it is worth. A new service called DocSyncer hopes to fix all that. DocSyncer is going to launch an invite-only beta in a few weeks (TechCrunch readers can sign up here to get first dibs). It uploads all of your Microsoft Office documents (Word, Excel, PowerPoint) from your desktop to Google Docs and then keeps them in sync. Whenever you make a change on your desktop, the change is automatically reflected in the corresponding file on Google Docs, and on DocSyncer.com. The service will require a small software download, which at first will only work on Windows computers (a Mac version is coming). But you will be able to sync from more than one computer—up to Google Doc’s current limit of 5,000 documents. When you click on a document icon, a second browser window instantly opens it up in Google Docs. 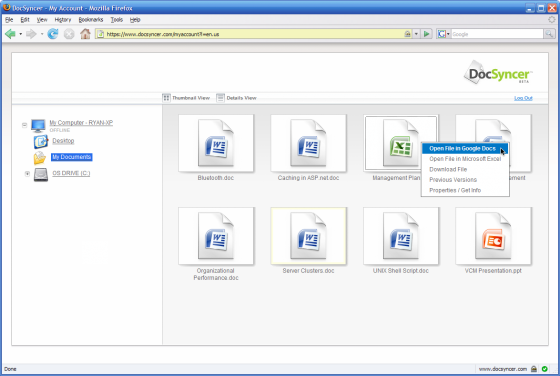 Through the browser interface, DocSyncer is trying to replicate the desktop experience. “The goal,” says Shaw, “s to build seamless desktop integration of Google Docs so the advantages of using Microsoft Office begin to fall away.” That’s a huge ambition, but DocSyncer could offer a small step in that direction. For instance, Shaw wants to get the load time from clicking on a browser icon to launching the Google Doc faster than launching a Word doc that is installed locally. He is not quite there yet. It took me about 7 to 10 seconds to launch a document in a demo account I was given access to, versus about 3 seconds to open up a Word doc (with Microsoft Word already fired up). But it does seriously close the gap compared to always hitting the back button inside Google Docs itself. DocSyncer could be used in many ways—for remote access to all your desktop documents or a secure off-site backup. Each document is individually encrypted and sent to Google over Secure Sockets Layer (SSL). Shaw’s hope is to make it a key migration tool for the next wave of people who are curious about Webtop productivity apps, but don’t want to give up their desktop documents (and why should they?). Google Docs needs a bulk-uploading and synchronizing feature. And all it would take would be a few tweaks to the Google Docs API to make that synchronization two-way so that any change in Google Docs would also be reflected in the original docs on your desktop. But I’m not sure this is a standalone company—ultimately either Google becomes DocSyncer’s angel buyer, or it builds this itself.